The Copts (Coptic: ⲚⲓⲢⲉⲙ̀ⲛⲭⲏⲙⲓ ̀ⲛ̀Ⲭⲣⲏⲥⲧⲓ̀ⲁⲛⲟⲥ, translit. 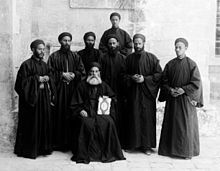 NiRemenkīmi enKhristianos; Arabic: أقباط‎, Aqbāt) are an ethnoreligious group indigenous to Northeast Africa who primarily inhabit the area of modern Egypt, where they are the largest Christian denomination in the country. Copts are also the largest Christian denomination in Sudan and Libya. Historically, they spoke the Coptic language, a direct descendant of the Demotic Egyptian that was spoken in late antiquity. Copts in Egypt constitute the largest Christian population in the Middle East and North Africa, as well as the largest religious minority in the region, accounting for an estimated 10–15% of the Egyptian population. Copts in Sudan constitute the largest Christian community in Sudan, and Copts in Libya constitute the largest Christian community in Libya, accounting for an estimated 1% of their respective populations. 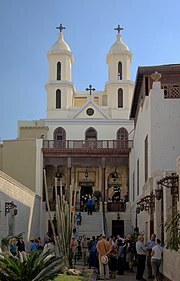 Most Copts adhere to the Coptic Orthodox Church of Alexandria, an Oriental Orthodox church. The smaller Coptic Catholic Church is an Eastern Catholic church in communion with the Roman Catholic Church. Copts of Egyptian ancestry maintain a distinct ethnic identity from Muslim Egyptians, generally rejecting an Arab identity. Genetically, Copts are a distinct population, albeit more closely related to the Muslims of Egypt than to any other population. Like other Egyptians, Copts are a diverse population, with considerable genetic, ethnic, and cultural differences persisting between Copts from Lower and Upper Egypt. The English language adopted the word Copt in the 17th century from New Latin Coptus, Cophtus, which derives from the Arabic collective qubṭ / qibṭ قبط‎ "the Copts" with nisba adjective qubṭī, qibṭī قبطى‎, plural aqbāṭ أقباط‎; Also quftī, qiftī (where the Arabic /f/ represents the historical Coptic /p/) an Arabisation of the Coptic word kubti (Bohairic) or kuptaion (Sahidic). The Coptic word in turn represents an adaptation of the Greek term for the indigenous people of Egypt, Aigýptios (Αἰγύπτιος). The Greek term for Egypt, Aigýptos (Ancient Greek: Αἴγυπτος), itself derives from the Egyptian language, but dates to a much earlier period, being attested already in Mycenaean Greek as a3-ku-pi-ti-jo (lit. "Egyptian"; used here as a man's name). This Mycenaean form is likely from Middle Egyptian ḥwt kꜣ ptḥ (reconstructed pronunciation /ħawitˌkuʀpiˈtaħ/ → /ħawiʔˌkuʀpiˈtaħ/ → /ħəˌkuʔpəˈtaħ/, Egyptological pronunciation Hut-ka-Ptah), literally "estate/palace of the k��� ("double" spirit) of Ptah" (compare Akkadian āluḫi-ku-up-ta-aḫ), the name of the temple complex of the god Ptah at Memphis (and a synecdoche for the city of Memphis and the region around it). The term Aigýptios in Greek came to designate the native Egyptian population in Roman Egypt (as distinct from Greeks, Romans, Jews, etc.). After the Muslim conquest of Egypt (639-646) it became restricted to those Egyptians adhering to the Christian religion. In Coptic, Copts referred to themselves as ni rem en kīmi en khristianos (Coptic: ⲚⲓⲢⲉⲙ̀ⲛⲭⲏⲙⲓ ̀ⲛ̀Ⲭⲣⲏⲥⲧⲓ̀ⲁⲛⲟⲥ), which literally means "Christian people of Egypt" or "Christian Egyptians". The Coptic name for Egyptians, rem en kīmi (Coptic: Ⲣⲉⲙ̀ⲛⲭⲏⲙⲓ), is realized in the Fayyumic Coptic as lem en kēmi, or rem en khēmi in the Bohairic dialect; cf. Egyptian rmṯ n kmt, Demotic rmṯ n kmỉ. The Arabic word qibṭ "Copt" has also been connected[by whom?] to the Greek name of the town of Kóptos (Koinē Greek: Κόπτος, now Qifṭ; Coptic Kebt and Keft) in Upper Egypt. This association may have contributed to making "Copt" the settled form of the name. In the 20th century some Egyptian nationalists and intellectuals in the context of Pharaonism began using the term qubṭ in the historical sense. The Copts are one of the oldest Christian communities in the Middle East. Although integrated in the larger Egyptian nation state, the Copts have survived as a distinct religious community forming around 10 to 20 percent of the population, though estimates vary. They pride themselves on the apostolicity of the Egyptian Church whose founder was the first in an unbroken chain of patriarchs. The main body for 16 centuries has been out of communion with both the Roman Catholic Church (in Rome) and the various Eastern orthodox churches. According to ancient tradition, Christianity was introduced within present day Egypt by Saint Mark in Alexandria, shortly after the ascension of Christ and during the reign of the Roman emperor Claudius around 42 AD. 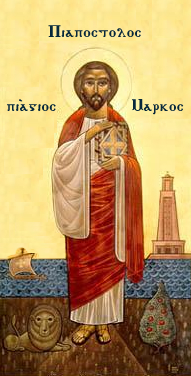 The legacy that Saint Mark left in Egypt was a considerable Christian community in Alexandria. From Alexandria, Christianity spread throughout Egypt within half a century of Saint Mark's arrival in Alexandria, as is clear from a fragment of the Gospel of John, written in Coptic, which was found in Upper Egypt and can be dated to the first half of the 2nd century, and the New Testament writings found in Oxyrhynchus, in Middle Egypt, which date around the year 200 AD. In the 2nd century, Christianity began to spread to the rural areas, and scriptures were translated into the local language, today known as the Coptic language, but known as the Egyptian language at the time. By the beginning of the 3rd century AD, Christians constituted the majority of Egypt's population, and the Church of Alexandria was recognized as one of Christendom's four Apostolic Sees, second in honor only to the Church of Rome. The Church of Alexandria is therefore the oldest Christian church in Africa. The Copts in Egypt contributed immensely to Christian tradition. The Catechetical School of Alexandria was the oldest catechetical school in the world. Founded around 190 AD by the scholar Pantanaeus, the school of Alexandria became an important institution of religious learning, where students were taught by scholars such as Athenagoras, Clement, Didymus, and Origen, the father of theology and who was also active in the field of commentary and comparative Biblical studies. However, the scope of this school was not limited to theological subjects; science, mathematics and humanities were also taught there. The question-and-answer method of commentary began there, and 15 centuries before Braille, wood-carving techniques were in use there by blind scholars to read and write. Another major contribution made by the Copts in Egypt to Christianity was the creation and organization of monasticism. Worldwide Christian monasticism stems, either directly or indirectly, from the Egyptian example. The most prominent figures of the monastic movement were Anthony the Great, Paul of Thebes, Macarius the Great, Shenouda the Archimandrite and Pachomius the Cenobite. By the end of the 5th century, there were hundreds of monasteries, and thousands of cells and caves scattered throughout the Egyptian desert. Since then pilgrims have visited the Egyptian Desert Fathers to emulate their spiritual, disciplined lives. Saint Basil the Great Archbishop of Caesarea Mazaca, and the founder and organiser of the monastic movement in Asia Minor, visited Egypt around 357 AD and his monastic rules are followed by the Eastern Orthodox Churches. Saint Jerome, who translated the Bible into Latin, came to Egypt while en route to Jerusalem around 400 AD and left details of his experiences in his letters. Saint Benedict founded the Benedictine Order in the 6th century on the model of Saint Pachomius, although in a stricter form. Coptic Christians practice male circumcision as a rite of passage. The major contributions that the See of Alexandria has contributed to the establishment of early Christian theology and dogma are attested to by fact that the first three Ecumenical councils in the history of Christianity were headed by Egyptian patriarchs. The Council of Nicaea (325 AD) was presided over by St. Alexander, Patriarch of Alexandria, along with Saint Hosius of Córdoba. In addition, the most prominent figure of the council was the future Patriarch of Alexandria Athanasius, who played the major role in the formulation of the Nicene Creed, recited today in most Christian churches of different denominations. One of the council's decisions was to entrust the Patriarch of Alexandria with calculating and annually announcing the exact date of Easter to the rest of the Christian churches. The Council of Constantinople (381 AD) was presided over by Patriarch Timothy of Alexandria, while the Council of Ephesus (431 AD) was presided over by Cyril of Alexandria. In 451 AD, following the Council of Chalcedon, the Church of Alexandria was divided into two branches. Those who accepted the terms of the Council became known as Chalcedonians or Melkites. Those who did not abide by the Council's terms were labeled non-Chalcedonians or Monophysites and later Jacobites after Jacob Baradaeus. The non-Chalcedonians, however, rejected the term Monophysites as erroneous and referred to themselves as Miaphysites. The majority of the Egyptians belonged to the Miaphysite branch, which led to their persecution by the Byzantines in Egypt. The Hanging Church in Coptic Cairo. In 641 AD, Egypt was conquered by the Arabs who faced off with the Byzantine army. Local resistance by the Egyptians however began to materialize shortly thereafter and would last until at least the 9th century. Under Muslim rule, Christians paid special taxes and had lower access to political power, but were exempt from military service. Their position improved dramatically under the rule of Muhammad Ali in the early 19th century. He abolished the Jizya (a tax on non-Muslims) and allowed Egyptians (Copts) to enroll in the army. Pope Cyril IV, 1854–61, reformed the church and encouraged broader Coptic participation in Egyptian affairs. Khedive Isma'il Pasha, in power 1863–79, further promoted the Copts. He appointed them judges to Egyptian courts and awarded them political rights and representation in government. They flourished in business affairs. Some Copts participated in the Egyptian national movement for independence and occupied many influential positions. Two significant cultural achievements include the founding of the Coptic Museum in 1910 and the Higher Institute of Coptic Studies in 1954. Some prominent Coptic thinkers from this period are Salama Moussa, Louis Awad and Secretary General of the Wafd Party Makram Ebeid. In 1952, Gamal Abdel Nasser led some army officers in a coup d'état against King Farouk, which overthrew the Kingdom of Egypt and established a republic. Nasser's mainstream policy was pan-Arab nationalism and socialism. The Copts were severely affected by Nasser's nationalization policies, though they represented about 10 to 20 percent of the population. In addition, Nasser's pan-Arab policies undermined the Copts' strong attachment to and sense of identity about their Egyptian pre-Arab, and certainly non-Arab identity which resulted in permits to construct churches to be delayed along with Christian religious courts to be closed. Many Coptic intellectuals hold to Pharaonism, which states that Coptic culture is largely derived from pre-Christian, Pharaonic culture, and is not indebted to Greece. It gives the Copts a claim to a deep heritage in Egyptian history and culture. Pharaonism was widely held by Coptic and Muslim scholars in the early 20th century, and it helped bridge the divide between those groups. Some scholars see Pharaonism as shaped by Orientalism. Egyptian Coptic monks at the American Colony, Jerusalem, between 1898 and 1914. Today, members of the non-Chalcedonian Coptic Orthodox Church constitute the majority of the Egyptian Christian population. 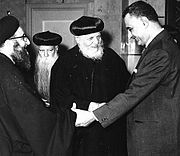 Mainly through emigration and partly through European, American, and other missionary work and conversions, the Egyptian Christian community now also includes other Christian denominations such as Protestants (known in Arabic as Evangelicals), Roman Catholics and Eastern Rite Catholics, and other Orthodox congregations. The term Coptic remains exclusive however to the Egyptian natives, as opposed to the Christians of non-Egyptian origins. Some Protestant churches for instance are called "Coptic Evangelical Church", thus helping differentiate their native Egyptian congregations from churches attended by non-Egyptian immigrant communities such as Europeans or Americans. In 2005, a group of Coptic activists created a flag to represent Copts worldwide. The previous head of the Coptic Orthodox Church, Pope Shenouda III of Alexandria, died 17 March 2012. On 4 November 2012, Bishop Tawadros was chosen as the new pope of Egypt's Coptic Christians. His name was selected from a glass bowl containing the three shortlisted candidates by a blindfolded boy at a ceremony in Cairo's St Mark's Cathedral. Sudan has a native Coptic minority, although many Copts in Sudan are descended from more recent Egyptian immigrants. Copts in Sudan live mostly in northern cities, including Al Obeid, Atbara, Dongola, Khartoum, Omdurman, Port Sudan, and Wad Medani. They number up to 500,000, or slightly over 1 percent of the Sudanese population. Due to their advanced education, their role in the life of the country has been more significant than their numbers suggest. They have occasionally faced forced conversion to Islam, resulting in their emigration and decrease in number. Modern immigration of Copts to Sudan peaked in the early 19th century, and they generally received a tolerant welcome there. However, this was interrupted by a decade of persecution under Mahdist rule at the end of the 19th century. As a result of this persecution, many were forced to relinquish their faith, adopt Islam, and intermarry with the native Sudanese. The Anglo-Egyptian invasion in 1898 allowed Copts greater religious and economic freedom, and they extended their original roles as artisans and merchants into trading, banking, engineering, medicine, and the civil service. Proficiency in business and administration made them a privileged minority. However, the return of militant Islam in the mid-1960s and subsequent demands by radicals for an Islamic constitution prompted Copts to join in public opposition to religious rule. Gaafar Nimeiry's introduction of Islamic Sharia law in 1983 began a new phase of oppressive treatment of Copts, among other non-Muslims. After the overthrow of Nimeiry, Coptic leaders supported a secular candidate in the 1986 elections. However, when the National Islamic Front overthrew the elected government of Sadiq al-Mahdi with the help of the military, discrimination against Copts returned in earnest. Hundreds of Copts were dismissed from the civil service and judiciary. In February 1991, a Coptic pilot working for Sudan Airways was executed for illegal possession of foreign currency. Before his execution, he had been offered amnesty and money if he converted to Islam, but he refused. Thousands attended his funeral, and the execution was taken as a warning by many Copts, who began to flee the country. Restrictions on the Copts' rights to Sudanese nationality followed, and it became difficult for them to obtain Sudanese nationality by birth or by naturalization, resulting in problems when attempting to travel abroad. The confiscation of Christian schools and the imposition of an Arab-Islamic emphasis in language and history teaching were accompanied by harassment of Christian children and the introduction of hijab dress laws. A Coptic child was flogged for failing to recite a Koranic verse. In contrast with the extensive media broadcasting of the Muslim Friday prayers, the radio ceased coverage of the Christian Sunday service. As the civil war raged throughout the 1990s, the government focused its religious fervour on the south. 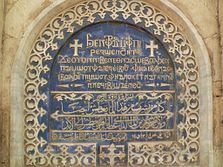 Although experiencing discrimination, the Copts and other long-established Christian groups in the north had fewer restrictions than other types of Christians in the south. Today, the Coptic Church in Sudan is officially registered with the government, and is exempt from property tax. In 2005, the Sudanese government of National Unity (GNU) named a Coptic Orthodox priest to a government position, though the ruling Islamist party's continued dominance under the GNU provides ample reason to doubt its commitment to broader religious or ethnic representation. The largest Christian group in Libya is the Coptic Orthodox Church, with a population of 60,000. The Coptic Church is known to have historical roots in Libya long before the Arabs advanced westward from Egypt into Libya. Living in countries with Muslim majorities (Egypt, Sudan, Libya), the size of the population of Copts is a continuously disputed matter, frequently for reasons of religious jealousy and animosity. The Coptic population in Egypt is difficult to estimate because researchers are forbidden by Egyptian authorities from asking a survey participant's religion, but some official estimates state that Coptic Christians represent from 5 to 10 percent or less of a population of over 83 million Egyptians while other independent and Christian sources estimate much higher numbers, up to 23 percent of the population. The Coptic population in Sudan is at about half a million or 1 percent of Sudanese population. Outside of the Coptic primary area of residence within parts of present-day Egypt (Copts in Egypt), Sudan (Copts in Sudan), and Libya (Copts in Libya), the largest Coptic diaspora population is located within the United States, Canada, and Australia. The numbers of the Censuses in the United States, Canada, and Australia are not fully correct since many Copts listed themselves in the 2011 Census mistakenly as either Egyptians, Sudanese, Libyans, Americans, Canadians or Australians and by this way reducing the Coptic population in the 2011 Census in the United States, Canada, and Australia respectively. Nevertheless, the Coptic American (US) population is estimated to number about 200,000 (estimates of Coptic organizations ranging as high as a million). The Coptic Canadian population is estimated to number about 50,000 (estimates of Coptic organizations ranging as high as 200,000). The Coptic Australian population is estimated to number about 50,000 (estimates of Coptic organizations ranging as high as 100,000). Smaller communities (below 100,000) are found in Australia, Kuwait, the United Kingdom, France, South Africa, and Canada. Minor communities below 10,000 people are reported from Jordan (8,000 Copts), Lebanon (3,000 – 4,000 Copts), Germany (3,000 Copts), Austria (2,000 Copts), Switzerland (1,000 Copts), and elsewhere. It is noted that Copts also live in Denmark, Greece, Italy, the Netherlands, Norway, Russia, and Sweden. The Coptic community has been targeted by hate crimes resulting in Copts being victims of murder by Islamic extremists. The most significant was the 2000–01 El Kosheh attacks, in which Muslims and Christians were involved in bloody inter-religious clashes following a dispute between a Muslim and a Christian. "Twenty Christians and one Muslim were killed after violence broke out in the town of el-Kosheh, 440 kilometres (270 mi) south of Cairo". In February 2001 a new Coptic church and 35 houses belonging to Christians were burned. In 2006, one person attacked three churches in Alexandria, killing one person and injuring 5–16. The attacker was not linked to any organisation and described as "psychologically disturbed" by the Ministry of Interior. In May 2010, The Wall Street Journal reported increasing waves of mob attacks by Muslims against Copts. Despite frantic calls for help, the police typically arrived after the violence was over. The police also coerced the Copts to accept "reconciliation" with their attackers to avoid prosecuting them, with no Muslims convicted for any of the attacks. In Marsa Matrouh, a Bedouin mob of 3,000 Muslims tried to attack the city's Coptic population, with 400 Copts having to barricade themselves in their church while the mob destroyed 18 homes, 23 shops and 16 cars. Boutros Boutros-Ghali is a Copt who served as Egypt's foreign minister under President Anwar Sadat. Previously, only two Copts were in Egypt's governmental cabinet: Finance Minister Youssef Boutros Ghali and Environment Minister Magued George during former president Mubarak's rule. There also use to be one Coptic governor out of 25, that of the upper Egyptian governorate of Qena, and is the first Coptic governor in decades due to the higher concentration of Copts in Upper Egypt. In addition, Naguib Sawiris, an extremely successful businessman and one of the world's 100 wealthiest people, is a Copt. In 2002, under the Mubarak government, Coptic Christmas (January 7) was recognized as an official holiday. However, many Copts continue to complain of being minimally represented in law enforcement, state security and public office, and of being discriminated against in the workforce on the basis of their religion. Most Copts do not support independence or separation movement from other Egyptians. The Egyptian Census of 1897 reported the percentage of Non-Muslims in Urban Provinces as 14.7 percent (13.2 percent Christians, 1.4 percent Jews). The Egyptian Census of 1986 reported the percentage of Non-Muslims in Urban Provinces as 6.1 percent (5.7 percent Christians, 0 percent Jews). The decline in the Jewish representation is interpreted through the creation of the state of Israel, and the subsequent emigration of the Egyptian Jews. There is no explanation for a 55 percent decline in the percentage of Christians in Egypt. It has been suggested that Egyptian censuses held after 1952 have been politicized to under-represent the Christian population. In August 2013, following the 3 July 2013 Coup and clashes between the military and Morsi supporters, there were widespread attacks on Coptic churches and institutions in Egypt by Sunni Muslims. According to at least one Egyptian scholar (Samuel Tadros), the attacks are the worst violence against the Coptic Church since the 14th century. "In December … Brotherhood leaders began fomenting anti-Christian sectarian incitement. The anti-Coptic incitement and threats continued unabated up to the demonstrations of June 30 and, with the removal of President Morsi … morphed into sectarian violence, which was sanctioned by … the continued anti-Coptic rhetoric heard from the group's leaders on the stage … throughout the sit-in." The Coptic language is the most recent stage of the Egyptian language. Coptic should more correctly be used to refer to the script rather than the language itself. Even though this script was introduced as far back as the 1st century BC, it has been applied to the writing of the Egyptian language from the 1st century AD to the present day. Coptic remained the spoken language of most Egyptians until it was slowly replaced by colloquial Egyptian Arabic around the 17th century, although it may have survived in isolated pockets for a little longer. Today, Coptic is the native language of only about 300 Copts around the world. It is also the liturgical language of the native Egyptian Churches (the Coptic Orthodox Church and the Coptic Catholic Church). It is taught worldwide in many prestigious institutions, but its teaching within Egypt remains limited. The Coptic calendar, also called the Alexandrian calendar, is used by the Coptic Orthodox Church and also by Ethiopia as its official calendar (with different names). This calendar is based on the ancient Egyptian calendar. To avoid the calendar creep of the latter, a reform of the ancient Egyptian calendar was introduced at the time of Ptolemy III (Decree of Canopus, in 238 BC) which consisted of the intercalation of a sixth epagomenal day every fourth year. However, this reform was opposed by the Egyptian priests, and the idea was not adopted until 25 BC, when the Roman Emperor Augustus formally reformed the calendar of Egypt, keeping it forever synchronized with the newly introduced Julian calendar. To distinguish it from the Ancient Egyptian calendar, which remained in use by some astronomers until medieval times, this reformed calendar is known as the Coptic calendar. Its years and months coincide with those of the Ethiopian calendar but have different numbers and names. The Feast of Neyrouz marks the first day of the Coptic year. Ignorant of the Egyptian language for the most part, the Arabs confused the Egyptian new year's celebrations, which the Egyptians called the feast of Ni-Yarouou (the feast the rivers), with the Persian feast of Nowruz. The misnomer remains today, and the celebrations of the Egyptian new year on the first day of the month of Thout are known as the Neyrouz. Its celebration falls on the 1st day of the month of Thout, the first month of the Egyptian year, which for AD 1901 to 2098 usually coincides with 11 September, except before a Gregorian leap year when it's September 12. Coptic years are counted from AD 284, the year Diocletian became Roman Emperor, whose reign was marked by tortures and mass executions of Christians, especially in Egypt. Hence, the Coptic year is identified by the abbreviation A.M. (for Anno Martyrum or "Year of the Martyrs"). The A.M. abbreviation is also used for the unrelated Jewish year (Anno Mundi). Every fourth Coptic year is a leap year without exception, as in the Julian calendar, so the above-mentioned new year dates apply only between AD 1900 and 2099 inclusive in the Gregorian Calendar. In the Julian Calendar, the new year is always 29 August, except before a Julian leap year when it's August 30. Easter is reckoned by the Julian Calendar in the Old Calendarist way. Genetic studies of Coptic Egyptians revealed them to be distinct from Muslim Egyptians insofar as they contained less non-Egyptian ancestry. Nevertheless, Copts are more closely related to Muslim Egyptians than any other population, and share most of their ancestry with the Muslims. More broadly, studies have showed Copts to be genetically intermediary between the populations of southern Europe and Nubia (two frequently-used reference points), with greater European affinities in the north and greater East African in the south. A study of Coptic immigrants from northern Egypt indicated that they are most closely related to Muslim Egyptians, as well as the populations of the southern Levant and Saudi Arabia. According to Y-DNA analysis by Hassan et al. (2008), around 45% of Copts in Sudan carry the haplogroup J. The remainder mainly belong to the E1b1b clade (21%). Both paternal lineages are common among other local Afroasiatic-speaking populations (Beja, Ethiopians, Sudanese Arabs), as well as many Nubians. E1b1b/E3b reaches its highest frequencies among North Africans, Levantine Middle Easterners, and Ethiopid Northeast Africans. The next most common haplogroups borne by Copts are the European-linked R1b clade (15%), as well as the archaic African B lineage (15%). Maternally, Hassan (2009) found that Copts in Sudan exclusively carry various descendants of the macrohaplogroup N. This mtDNA clade is likewise closely associated with local Afroasiatic-speaking populations, including Berbers and Ethiopid peoples. Of the N derivatives borne by Copts, U6 is most frequent (28%), followed by the haplogroup T (17%). A 2015 study by Dobon et al. identified an ancestral autosomal component of West Eurasian origin that is common to many modern Afroasiatic-speaking populations in Northeast Africa. Known as the Coptic component, it peaks among Egyptian Copts who settled in Sudan over the past two centuries. Copts also formed a separated group in PCA, a close outlier to other Egyptians, Afro-Asiatic-speaking Northeast Africans and Middle East populations. The Coptic component evolved out of a main Northeast African and Middle Eastern ancestral component that is shared by other Egyptians and also found at high frequencies among other Afro-Asiatic-speaking populations in Northeast Africa (~70%). The scientists suggest that this points to a common origin for the general population of Egypt. They also associate the Coptic component with Ancient Egyptian ancestry, without the later Arabian influence that is present among other Egyptians. 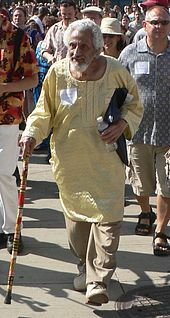 Halim El-Dabh at a Cleveland festival in 2009. 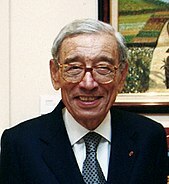 Boutros Boutros-Ghali, the sixth Secretary-General of the United Nations. Rami Malek, an Egyptian-American actor of Coptic and Greek descent. Mena Massoud, an Egyptian-Canadian actor. Fayez Sarofim, heir to the Sarofim family fortune. Naguib Sawiris, the CEO of Orascom. Magdi Yacoub, Egyptian-British cardiothoracic surgeon. ^ a b c "Coptic Orthodox Christmas to be low-key – Tight security: On alert after bombing in Egypt". Montreal Gazette. 4 January 2011. Archived from the original on 23 February 2011. Retrieved 5 January 2011. ^ "Egyptian Coptic protesters freed". BBC. 22 December 2004. ^ Official population counts put the number of Copts at around 10–15 percent of the population, while some Coptic voices claim figures as high as 23 percent. While some scholars defend the soundness of the official population census (cf. E.J. Chitham, The Coptic Community in Egypt. Spatial and Social Change, Durham 1986), most scholars and international observers assume that the Christian share of Egypt's population is higher than stated by the Egyptian government. Most independent estimates fall within range between 10 percent and 20 percent, for example the CIA World Factbook "Egypt". The World Factbook. CIA. Retrieved 27 August 2010. , Khairi Abaza; Mark Nakhla (25 October 2005). "The Copts and Their Political Implications in Egypt". The Washington Institute. Retrieved 27 August 2010. , Encyclopædia Britannica (1985), or Macropædia (15th ed., Chicago). For a projected 83,000,000+ Egyptians in 2009, this assumption yields the above figures. In 2008, Pope Shenouda III and Bishop Morkos, bishop of Shubra, declared that the number of Copts in Egypt is more than 12 million. In the same year, father Morkos Aziz the prominent priest in Cairo declared that the number of Copts (inside Egypt) exceeds 16 million. "?". United Copts of Great Britain. 29 October 2008. Retrieved 27 August 2010. and "?". العربية.نت. Retrieved 27 August 2010. Furthermore, the Washington Institute for Near East Policy Khairi Abaza; Mark Nakhla (25 October 2005). "The Copts and Their Political Implications in Egypt". Retrieved 27 August 2010. Encyclopædia Britannica (1985), and Macropædia (15th ed., Chicago) estimate the percentage of Copts in Egypt to be up to 20 percent of the Egyptian population. ^ a b c Tore Kjeilen. "Coptic Church - LookLex Encyclopaedia". Archived from the original on 2016-03-04. ^ a b 2009 American Community Survey, U.S. Census Bureau "All Egyptians including Copts 197,160"
^ According to published accounts and several Coptic/US sources (including the US-Coptic Association), the Coptic Orthodox Church has between 700,000 and one million members in the United States (c. 2005–2007). "Why CCU?". Coptic Credit Union. Retrieved June 21, 2009. ^ a b "Coptics flock to welcome 'Baba' at Pittsburgh airport". Pittsburgh Tribune (2007). Archived from the original on March 19, 2009. Retrieved June 21, 2009. 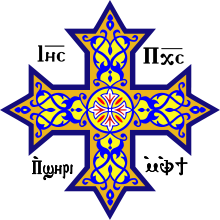 ^ a b "State's first Coptic Orthodox church is a vessel of faith". JS Online (2005). Archived from the original on August 21, 2011. Retrieved June 21, 2009. ^ a b "Coptic Diaspora". US-Copts Association (2007). Archived from the original on 2007-02-20. Retrieved June 21, 2009. ^ a b c In the year 2003, there was an estimated 70,000 Copts in New South Wales alone: "Coptic Orthodox Church (NSW) Property Trust Act 1990". New South Wales Consolidated Acts. ^ "Le religioni in Italia: La Chiesa copta". ^ Teller, Matthew (12 July 2015). "Free to pray - but don't try to convert anyone". BBC. Retrieved 12 July 2015. Ten-thousand or more live in the UAE, and young, bearded priest Father Markos, 12 years in Dubai, told me his flock are "more than happy - they enjoy their life, they are free." ^ "King commends Coptic Church's role in promoting coexistence". Jordanembassyus.org. June 3, 2005. Archived from the original on September 26, 2011. Retrieved November 18, 2011. ^ "Orthodox Copts open church in Switzerland". Swissinfo.org. July 17, 2004. Retrieved November 18, 2011. ^ a b c d "Egypt from "U.S. Department of State/Bureau of Near Eastern Affairs"". United States Department of State. September 30, 2008. ^ a b c d "Egypt from "Foreign and Commonwealth Office"". Foreign and Commonwealth Office -UK Ministry of Foreign Affairs. August 15, 2008. Archived from the original on December 12, 2012. ^ Bailey, Betty Jane; Bailey, J. Martin (2003). Who Are the Christians in the Middle East?. Wm. B. Eerdmans Publishing. p. 145. ISBN 978-0-8028-1020-5. ^ Dobon, Begoña; Hassan, Hisham Y.; Laayouni, Hafid; Luisi, Pierre; Ricaño-Ponce, Isis; Zhernakova, Alexandra; Wijmenga, Cisca; Tahir, Hanan; Comas, David; Netea, Mihai G.; Bertranpetit, Jaume (28 May 2015). "The genetics of East African populations: a Nilo-Saharan component in the African genetic landscape". Scientific Reports. 5 (1). doi:10.1038/srep09996. ISSN 2045-2322. ^ Ackroyd, P. R.; Evans, C. F. (1963). The Cambridge History of the Bible: Volume 1, From the Beginnings to Jerome. Cambridge University Press. p. 27. ISBN 9780521099738. Retrieved 16 October 2016. ^ qtd. in M. Hussein. el Ittigahat el Wataneyya fil Adab el Muʻaṣir [National Trends in Modern Literature]. Vol. 2. Cairo, 1954. ^ a b c IPS News . Retrieved 09-27-2008. ^ a b c Chan, Kenneth. Thousands Protest Egypt's Neglect of Coptic Persecution". The Christian Post. December 7, 2004. Retrieved 28 September 2008. ^ a b "The Copts and Their Political Implications in Egypt". ^ NLG Solutions Archived 2016-03-24 at the Wayback Machine <Online>. Egypt. Retrieved 28 September 2008. ^ a b Nisan, Mordechai (2002). Minorities in the Middle East. McFarland. p. 144. ISBN 978-0-7864-1375-1. ^ van der Vliet, Jacques (June 2009), "The Copts: 'Modern Sons of the Pharaohs'? ", Church History & Religious Culture, 89 (1–3): 279–90, doi:10.1163/187124109x407934 . ^ Reid, Donald Malcolm (2003). "7". Whose Pharaohs? : Archaeology, Museums, and Egyptian National Identity from Napoleon to World War I. U. of California Press. pp. 258ff. ^ Matson, G. Olaf (1925). The American Colony Guide-book to Jerusalem and Environs. Vester. p. 20. Retrieved 7 September 2017. Copts. A very small community representing the large Coptic Church in Egypt.[...] Abyssinian. Also represented by a Bishop in Jerusalem. They, like the Copts, are Monophysites. ^ "Freecopts.net". freecopts.net. Retrieved 2018-03-17. ^ "Bishop Tawadros new pope of Egypt's Coptic Christians". BBC News. 4 November 2012. Retrieved 4 November 2012. ^ a b c "Copts". ^ Yerkes, Sarah (20 June 2016). "What Egypt under Sissi is really like for Coptic Christians". Egyptian authorities prevent surveyors from asking a participant’s religion when doing research. ^ "Egyptian Coptic protesters freed". BBC. 22 December 2004. Retrieved 27 August 2010. ^ "Research in population and demography of France estimates the coptic population to be". Institut National Etudes Démographiques. ^ "Estimates of the size of Egypt's Christian population vary from the low government figures of 6 to 7 million to the 12 million reported by some Christian leaders. The actual numbers may be in the 9 to 9.5 million range, out of an Egyptian population of more than 60 million". The Washington Post. Retrieved 10 October 2008. ^ Egypt from "msn encarta". Encarta. September 30, 2008. Archived from the original on 2009-10-31. ^ "Reports on Religious Freedom: Libya". Jewish Virtual Library. Retrieved 2018-03-11. ^ According to published accounts and several Coptic/US sources (including the US-Coptic Association), the Coptic Orthodox Church has between 700,000 and one million members in the United States (c. 2005–2007). ^^ "Why CCU?". Coptic Credit Union. Retrieved June 21, 2009. ^ "Protest Egyptian government allowing criminal attacks on Coptic Christians". ^ a b "Diocese of Australia". Diocese of Australia. ^ "Kuwait". U.S. Department of State. Retrieved 2018-03-17. ^ "Protest Egyptian government allowing criminal attacks on Coptic Christians". www.canadafreepress.com. Retrieved 2018-03-17. ^ Burnand, Frédéric. "Orthodox Copts open church in Switzerland". SWI swissinfo.ch. Retrieved 2018-03-17. ^ WorldWide Religious News. Church Building Regulations Eased Archived March 18, 2009, at the Wayback Machine. December 13, 2005. ^ "Copts Under Fire". The Free Lance-Star. November 23, 2002. Retrieved August 2, 2015. ^ Miles, Hugh (April 15, 2006). "Coptic Christians attacked in churches". London: The Telegraph. Retrieved 2008-10-07. ^ a b c Zaki, Moheb (May 18, 2010). "Egypt's Persecuted Christians". The Wall Street Journal. Retrieved June 4, 2010. ^ "United States Commission on Int'l Religious Freedom" (PDF). USCIRF. ^ Abrams, Joseph (April 21, 2010). "House Members Press White House to Confront Egypt on Forced Marriages". foxnews.com. Retrieved November 8, 2010. ^ ArabicNews.com. Copts welcome Presidential announcement on Eastern Christmas Holiday Archived September 30, 2007, at the Wayback Machine. December 20, 2002. ^ Human Rights Watch. World report 2007: Egypt Archived September 28, 2008, at the Wayback Machine. ^ "Egypt: National Unity and the Coptic issue. (Arab Strategic Report 2004-2005)". Archived from the original on 2007-09-12. Retrieved 2007-09-12. ^ Associated Press. Egypt court upholds right of converted Muslims to return to Christianity Archived November 21, 2011, at the Wayback Machine. 2008-02-09. ^ AFP. Egypt allows converts to revert to Christianity on ID Archived April 16, 2009, at the Wayback Machine. February, 2008. ^ Chulov, Martin (Aug 15, 2013). "Egypt's Coptic Christians report fresh attacks on churches: Christian leaders blame Muslim Brotherhood supporters for arson and other attacks, including shooting death of teenage girl". The Guardian. Retrieved 2013-08-16. ^ Khairat, Mohamed (Aug 16, 2013). "Coptic churches burn amid violence in Egypt: Coptic Christians call for greater protection as wave of violence sweeps across Egypt". Egyptian Streets. Retrieved 2013-08-16. ^ Gilbert, Lela (25 May 2015). "Egypt's Coptic Christians - Braced for Persecution". Hudson Institute. Retrieved 17 February 2018. ^ Egyptian Streets. "Coptic churches burn amid violence in Egypt". Egyptian Streets. ^ "Joint Press Release: Non-peaceful assembly does not justify collective punishment - Rights groups condemn lethal violence against those in sit-in and terrorist acts of the Muslim Brotherhood". 15 August 2013. Egyptian Initiative for Personal Rights. Retrieved 22 August 2013. ^ "The Coptic Studies' Corner". Archived from the original on 2012-04-19. ^ a b "The Coptic Calendar of Martyrs". Coptic Orthodox Church Network. ^ "Coptic Orthodox Calendar / Easter Calculation". copticchurch.net. Retrieved 2018-03-17. ^ a b Dobon, Begoña; Hassan, Hisham Y.; Laayouni, Hafid; Luisi, Pierre; Ricaño-Ponce, Isis; Zhernakova, Alexandra; Wijmenga, Cisca; Tahir, Hanan; Comas, David; Netea, Mihai G.; Bertranpetit, Jaume (2015). "The genetics of East African populations: A Nilo-Saharan component in the African genetic landscape". Scientific Reports. 5: 9996. doi:10.1038/srep09996. PMC 4446898. PMID 26017457. ^ Mohamed, Hisham Yousif Hassan. "Genetic Patterns of Y-chromosome and Mitochondrial DNA Variation, with Implications to the Peopling of the Sudan" (PDF). University of Khartoum. Retrieved 13 October 2016. ^ Begoña Dobon; et al. (28 May 2015). "The genetics of East African populations: a Nilo-Saharan component in the African genetic landscape" (PDF). Scientific Reports. 5: 9996. doi:10.1038/srep09996. PMC 4446898. PMID 26017457. Retrieved 13 June 2015. ^ Begoña Dobon; et al. (28 May 2015). "The genetics of East African populations: a Nilo-Saharan component in the African genetic landscape" (PDF). Scientific Reports. 5: 8. doi:10.1038/srep09996. PMC 4446898. PMID 26017457. Retrieved 13 June 2015. The North African/Middle Eastern genetic component is identified especially in Copts. The Coptic population present in Sudan is an example of a recent migration from Egypt over the past two centuries. They are close to Egyptians in the PCA, but remain a differentiated cluster, showing their own component at k = 4 (Fig. 3). Copts lack the influence found in Egyptians from Qatar, an Arabic population. It may suggest that Copts have a genetic composition that could resemble the ancestral Egyptian population, without the present strong Arab influence. Look up Copt in Wiktionary, the free dictionary.